Consider this a sneak preview of our new Universal Mirror Handle. 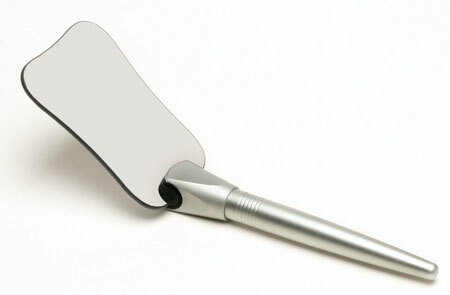 The handle is designed to work with most intraoral mirrors that have been made in the last few decades. You can position the mirror inline with the handle (shown below) or the mirror can be angled (as shown above). There is approximately 35° of rotation to allow comfortable positioning for buccal and occlusal views. Unlike other handles on the market, our Universal Mirror Handle can be locked to hold the mirror at the angle you choose. The Universal Mirror Handle will be available by the end of January and will be available by itself as well as in kits with mirrors. If you would like to be notified when the handle is available, please email us at info@photomed.net and we will contact you as soon as it is in stock. We listened to your feedback! 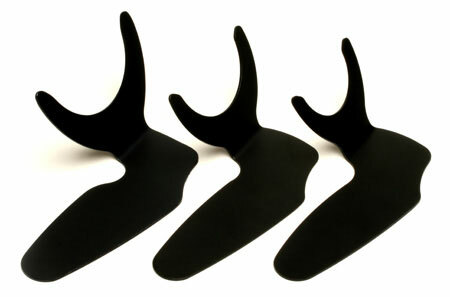 Our Occlusal Contrasters have been very popular since they were introduced. Some offices found that certain patients' mouths fell right between the two original sizes. Based on this feedback, we are happy to introduce the new "medium" size. The Occlusal Contrasters are now available in Large (65mm opening), Medium (55mm opening) and Small (45mm opening). We also have "kit" pricing when you purchase the set of three. Further evidence of how much film sales have fallen due to digital technology. Eastman Kodak Co. has announced that it is getting out of the wholesale photofinishing business and closing its three remaining photofinishing labs in the U.S. and Canada. Through January 17, 2009, Canon is offering instant rebates on their popular EOS 40D and 50D as well as 16 lenses and 3 flashes. Click here to see all of the Canon items and their rebate amounts. Is there a product that you would like us to carry or a service that you think we should offer? Let us know! We are always looking for new ways to help our doctors. Don't forget those end-of-year purchases for tax purposes. We will be open until 4pm on Dec. 31st. and can make sure your purchase gets into 2008.